The first song, Stay with me ~Ren’ai Nante Himatsubushi~ is a collaboration with Lily Franky and BOSE. The verses are great, but the chorus is incredibly repetitive. I loved this song the first listen… but after a while I just wanted to shoot myself. I basically didn’t know who most of the collaborators on the album were, so I had to look up Lily Franky and BOSE (kind of creepy lads to be honest). The duet between Lily Franky and Rie fu at the end was pretty though. Just like you is perhaps one of the most repetitive songs Rie fu has ever done. It has a pretty acoustic feeling in the beginning, which I adore. Unfortunately the chorus is just Rie fu and LEO repeating “just like you,” over and over. Nonetheless this is a good song that could have used a little more length and depth. Irodotte begins with an a capella duet between Rie fu and one of the singers (or both of them? Who the hell are Mina Ganaha and Mayumix anyway?) This song has a moderate pace and it’s kind of a cute song. The instrumentation is pretty repetitive unfortunately.Unlike the previous track, this song is too long. Next up is Don’t Worry, including KAT and Yuka from moumoon (artists I actually know, yay!) This track is beautifully done, and all the artists are on their a-game. This song is an acoustic track with a cute chorus. This is a throwback to a lot of Rie fu’s early stuff. The verses are the best part of this song IMO. Okay, it’s time for an oddity: STAR. The song begins with some funky synth beats that remind me of music from… past decades. 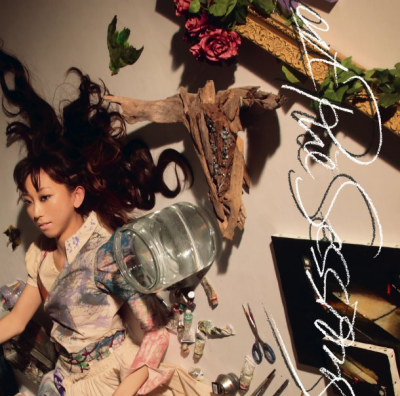 Rie fu collaborates with Ifu Sarasa (who??) and Kenji Suzuki (guitar). Regardless of the weird instrumentals, this is a pretty cute. This song could have totally fit on her past album because of its retro feel. One of the better tracks on the album. Sunshine Forehead is also kind of odd to me. It has this earthy flute flowing through the song, which makes me think of hippies. Curly Giraffe is apparently the alias of Kiyoshi Takakuwa, a bassist for the band, Great3. Either way, this is too hippie-like for me to enjoy. Also, I am not a fan of the accompanying male vocals. My Start continues with the retro feel of the album. I haven’t heard of Kenichi Takemoto or Peter Kvint either, so that took away from the song. The second verse is my favorite part of the song because of the uplifting lyrics. This song is entirely in English. Haha so I definitely love the beginning lyrics of Gilles. “All day all morning we are stressed because we have to get up.” Come on, I think every student can relate. I actually know the collaborators in this song (at least the former): NAOTO from ORANGE RANGE and kohei from HOI FESTA. I wish this song had a little more life to it though; the chorus seemed kind of flat. Laundry is another 3-female collaboration, this time including YUI from RYTHEM and Akiko Nakashima. I think all the ladies harmonize quite well together. This song is definitely a mellow track, and even includes a segment of falling rain. This is a nice way to begin winding down the album. Bright Life is a lovely song, and working with Satou Honoka from aluto was a smart choice. This song reminded me of Rie fu songs like Long Long Way (one of my favorite Rie fu songs ever). This song is totally acoustic, and uses piano and strings exclusively. Beautiful. Lastly we end with the folksy Hitotsu, Hitotsu. Rie fu joins forces with Seira, Shiina Junpei, and Chris Tomoko (I don’t know any of them xD). The clapping during the verses is really cute. Although this is a mellow, acoustic song, it ends the album like a lullaby. Overall: It’s hard to wrap up this album in just a few words. Some songs are fantastic while others aren’t up to par. Overall this is Rie fu’s most retro/folksy album to date. Even if you don’t like all of the songs this album is still worth getting.